Our wildlife is partial to native plants. Using native plants is a great way to create habitat for native wildlife. Bobwhite Quail •et; Native grasses and forbs make ideal quail habitat. Use the Wildlife Chuckwagon to create the foraging opportunities provided by the forbs. Include the Companion Grass mix to add the structure of native grasses. Some bare ground is ideal because it provides easy travel between plants and plenty of dusting areas. A few areas with shrubby cover nearby will provide shelter. Whitetail Deer •et; Deer like to eat plants that are green and growing. Buck's Hangout provides a food source in the fall, or to provide year-round browse, use the Wildlife Chuckwagon. Plant Hide and Sneak on foodplot borders to make the feeding area feel like a safe haven or along the road to create a screen. 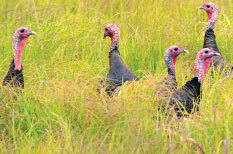 Eastern Wild Turkey •et; Insects and seeds are a major component of turkeys' diets. Wildlife Chuckwagon will produce many different types of seed and attract insects throughout the growing season; complement this mix with Companion Grass to create better structure. Buck's Hangout also be a component of turkey habitat. Lastly, Hide & Sneak can be used to create a refuge. Pollinators •et; Populations of many native pollinators are declining. Pollinators need plants that bloom throughout the growing season. Use the Butterfly and Hummingbird mix along with Companion Grass mix to create quality pollinator habitat. New construction sites and steep slopes are considered critical areas. See special instructions for these areas in our critical area treatment guide.